Since the beginning of German-Indian economic relations, going back to Fugger family, a dynasty of merchants from Augsburg, and their commitment to a merchant fleet to Goa, the German interest in India has grown steadily. Today, Germany ranks seventh in direct foreign investment in India. About 600 joint ventures are headquartered in the South Asian country; over 1,800 German companies are located there. 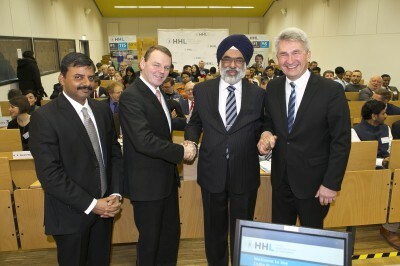 The second India Business Day, which was hosted in Leipzig on January 30, 2017 by HHL Leipzig Graduate School of Management together with the Indian Embassy in Berlin, provided the over 100 guests with an impression of the opportunities and challenges which German companies may encounter on the Indian market. The participants learned about the “Make in India Mittelstand (MIIM)” investment facilitation program and the “Start-up India” initiative initiated by the Embassy of India in Germany. In his introduction, HHL Dean Prof. Dr. Andreas Pinkwart emphasized the joint democratic and economic values of Germany and India. Although the results of the cooperation are not yet satisfactory in all areas despite numerous programs, Prof. Dr. Pinkwart expressed that both countries could “be strong partners in promoting a more humane, peaceful and sustainable future for the world.” Against the background of Brexit, Prof. Dr. Pinkwart sees new impetus to intensify Indian-German cooperation in education and research. “Overnight, Germany has become the EU country with the largest number of English-speaking inhabitants by far. This provides new opportunities for the exchange of students and junior researchers which should be seized upon without hesitation,” said Prof. Dr. Pinkwart. Looking at HHL, the Dean commented, “Indian students represent the largest group of students and exchange students at HHL now. In return, more and more of our German students spend their terms abroad in India.” There have been several cases where these exchanges led to the establishment of German-Indian start-ups – a field which HHL, as Germany’s leading entrepreneurial university, would like to expand. Prof. Dr. Pinkwart specifically mentioned the “Start-up India” initiative, which was launched by the Indian Prime Minister Modi, in this context. With the goal of creating an ecosystem which promotes the growth of start-ups, Germany could help India “to become a nation of entrepreneurs”, commented Prof. Dr. Pinkwart. The personal contact, education, academic exchange programs, training and qualification of employees as well as scientific and technological partnerships are at the core of the economic relations between the two nations, according to Gurjit Singh, Ambassador of the Republic of India to Germany. In his opinion, the bilateral partnerships between companies (B2B) as well as the training and qualification of employees particularly need to be increased. The Ambassador appealed to the guests to not adopt a reductionist view of his country’s trade volume; the ASEAN Free Trade Area, which now includes 600 million people from ten countries, allowed India to expand its economic efficiency. The Ambassador sees ideal connections in the Industry 4.0 projects of German companies with the “Make in India Mittelstand (MIIM)” initiative. “We invite German entrepreneurs to gain an economic foothold in India and train talented employees,” said Ambassador Singh. Dr. Fritz Jaeckel, State Minister and Chief of the Saxon State Chancellery, emphasized the opportunities for India and China in his speech. However, bureaucracy, insufficient infrastructure and corruption represent great challenges for German investors. According to Dr. Jaeckel, India is on the right path thanks the reforms initiated by Prime Minister Modi. The Saxon State Minister pointed out that particularly the “Make in India Mittelstand (MIIM)” program could spur on the German-Indian business relations. Prof. Shailendra Kumar Rai, Ph.D., who holds the ICCR Chair of Corporate Responsibility and Governance at HHL, which is sponsored by the Indian Council for Cultural Relations (ICCR), urged for a reform of the tax code in India on the margins of the conference. He believes that the country’s educational system should be changed as well. “Right now, we are growing but growth alone does not give people employment. We certainly do not have a problem with unemployment but with underemployment. To resolve this, qualification programs should be developed and the educational system should be changed accordingly.” Prof. Rai suggested exchange programs between Germany and India for schools as well as small (e.g. start-ups) and large companies in this context. The goal should be to get to know the other culture. The Indian professor also suggested a three-month exchange program for workers from India to come to Germany which will then allow them to work for German companies in India afterwards. “India is a land of numerous opportunities. Germany companies could choose a few industries and invest in India, just like Japanese and Korean businesses have been doing. Fabian Schaaf-Mehta, who obtained his MBA from HHL and founded Animod, a start-up specializing in short trips, confirmed this, saying, “Many Germans are too naive when going about investments in India. How is business conducted here and in India? In Germany, people tend to start negotiations relatively quickly but in India, you have to invest in the relationship with the customer/partner first. Once trust has been established, the negotiations can begin. What is more: in Germany, you discuss a certain point which can then be recorded in writing in the contract. In India, the discussion can go back and forth. Yes does not have to mean yes. It is very important to be able to read all the details in the relationship with the partner. Then you can successfully do business in India.